This map of Maricopa County, Arizona, which shows the location of most of the cities and towns comprising Greater Phoenix will help you in planning your trip to the Valley of the Sun. 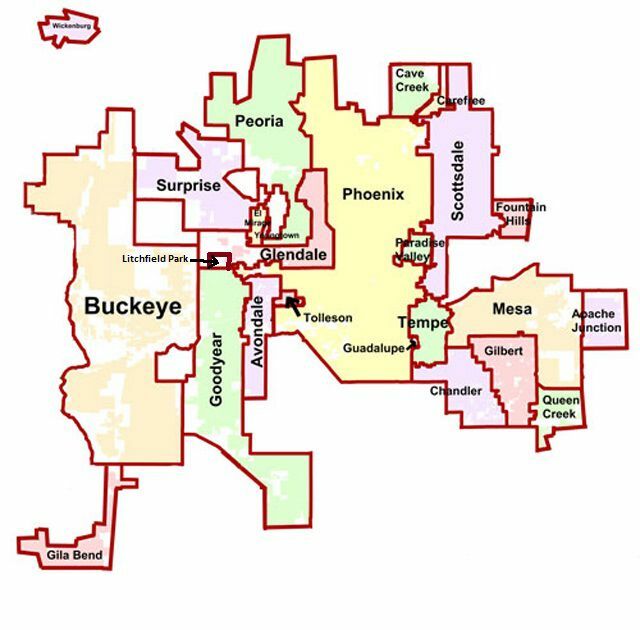 Although the U.S. Census defines Greater Phoenix as including Pinal County, when most people refer to "the Phoenix area," they usually mean the cities and towns that are adjacent in Maricopa County, the most populous county in the state. The purpose of this map is to simply provide visual assistance when you are looking for a hotel or motel in the Greater Phoenix area. So, for instance, if you are visiting relatives in Surprise in the northwest part of town, you'll note by looking at the map that staying in Chandler in the southeast part of town might not be the most convenient choice. (Note: The boundaries on this map are not precise and this map is not drawn to scale.) For assistance with determining distances between various cities and towns, check the tables of driving times and distances for the Phoenix area. Now that you have an idea of what part of town would be the best place for your stay, check out these lists of recommended hotels and resorts. You'll find motels, hotels, and luxury accommodations near the light rail, airport, stadiums, convention center, Arizona State University, museums, resorts, and more areas of interest in the Greater Phoenix area. North Phoenix: You'll find the communities of Deer Valley and North Mountain in this area that is north of downtown, or central Phoenix. Paradise Valley Mall is a major shopping center at Tatum Boulevard and Cactus Road. Downtown Phoenix: Having gone through quite a revival, downtown Phoenix is an ideal place to stay to experience this desert city. There is a business and entertainment district, an arts district with art galleries on Roosevelt Row, pubs, upscale bars, bistros and the downtown campus of Arizona State. The Arizona Diamondbacks play here at Chase Field. There are museums for all ages and theaters. West Phoenix: West Phoenix, not to be confused with the West Valley, is not a draw for visitors to the area. It consists of light industrial and lower-income homes. Central Phoenix and Paradise Valley: Much of Central Phoenix is accessible from the light rail. Paradise Valley a small upscale town. It is known for luxury golf courses, high-end shopping, and restaurants. Downtown and Central Scottsdale: An upscale town famous for Spring Training baseball, art galleries, and the Barrett-Jackson Car Classic, has some beautiful golf resorts, historic downtown, and a wonderful western history. North Scottsdale: Upscale residential areas and the Frank Lloyd Wright desert school and home, Taliesin West, are located here. Carefree and Cave Creek: North of Scottsdale, these two communities have an Arizona small-town vibe. Art shows, western home decor shops, hiking, and horseback riding in the desert are a draw. Tempe: Tempe is home to Arizona State University, Mill Street with restaurants and special events, and Tempe Town Lake. Mesa: Mesa is the third largest city in Arizona. The Arizona Museum of Natural History and i.d.e.a. Museum for children are draws. Mesa has a great little main street with both vintage buildings and the modern Mesa Arts Center. Chandler and Gilbert: Both of these communities east of Phoenix are family-friendly suburbs. Glendale: Historic Glendale, west of Phoenix, is known for special events such as Glendale Glitters and the annual chocolate festival. State Farm Stadium is home to the Arizona Cardinals. Peoria, Surprise, and Sun City: Peoria and Surprise are newer suburbs featuring family homes as well as active retirement complexes. Del Webb's Sun City, Sun City West, and Sun City Grand are located in the area. Surprise Stadium is a Cactus League spring training facility. Avondale, Goodyear, Litchfield Park, and Buckeye: Look for more active retirement living (such as Sun City Festival in Buckeye) as well as new family developments and golf courses. ISM Raceway, featuring NASCAR racing is in Avondale. Phoenix Sky Harbor International Airport - The airport is located in the southern part of Phoenix in an industrial area. It is advised to stay in hotels and motels close in to the airport.